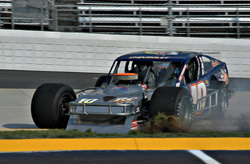 In 2004, Eddie Flemke finished a strong second in the NASCAR Modified point standings. In 2005, he finished 12th in the standings. In 2004, he won a pair of races. In 2005, he went winless. In 2004, he had 12 top five finishes. In 2005, he had only four. So judging by the numbers, Flemke had a terrible season right? Far from it. While the on track finishes aren’t what Flemke or his car owner Gary Teto had hoped for, they weren’t bad considering that Flemke joined the team two weeks before the start of the season and the #10 team was not a full-time operation before that. So in this case, the numbers do lie. Flemke thinks that there was enough promise shown by the marriage of driver and team to warrant another year together in 2006. “I think that we’ll be back together. I really do,” said Flemke. “We had a very good year when it came to working together. There are a few things that need to be ironed out, but there’s nothing that can’t be overcome. Cautious and conservative sometimes means not having all of the resources possible at your disposal. An example of that came in the season finale at Thompson, where the team lost nearly 60 laps after repairing accident damage. But there is no lack of effort from the #10 team and Flemke appreciates that. The #10 at New Hampshire. One of those things that needs to be addressed is under the hood. As some teams are spending over $50,000 for race motors, the #10 team has struggled just a bit to keep up. 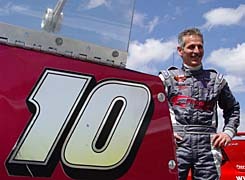 2005 was Flemke's first season in the #10 car. Flemke said that car owner Gary Teto was satisfied with the bottom line of the race team this past season. So 2005 was a building year for Flemke and the #10 team. That means that there could be big dividends coming in 2006.